The 74-year-old passed away at the Glasgow Royal Infirmary on Wednesday night. Former Celtic footballer Joe McBride has died days after suffering a stroke. Mr McBride was a member of the Lisbon Lions team which won the European Cup in 1967 but he did not play in the final after an injury. 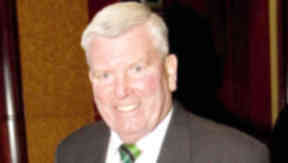 He played for Celtic from 1965 until 1968 after transferring from Motherwell. He was brought to the Parkhead side by legendary manager Jock Stein. He went on to score 44 goals across 67 appearances for Hibernian between 1968 and 1971. Mr McBride fell ill at his home in Glasgow over the weekend and was diagnosed as having suffered a stroke. Celtic manager Neil Lennon offered the club's sympathies to Mr McBride's family. He said: "The loss of Joe is terrible news. It was a pleasure to be in Joe's company and on a personal level, Joe was someone who was always very supportive to myself. I know Joe Junior (McBride's son) well too and on behalf of the whole management and backroom team, and the players, we offer our sincere condolences to Joe's family. We know this will be a very difficult time for them all." Former team mate Tommy Gemmell told The Herald: “This has come as a terrible shock. Joe was a great lad and we had some great moments together. A statement on Hibernian's website said: "Hibernian Football Club is saddened to learn of the death of former player Joe McBride last night. He was 74. A prolific striker, McBride's association with Hibernian was brief - totalling 91 appearances in just over two years - but he made a huge impact and scored a phenomenal 58 goals. "Our sincere thoughts are with his family at this difficult time - he left a lasting impression on our club and he will always be remembered with great affection." Mr McBride, who was born in Govan, additionally played for Clyde and Dunfermline Athletic during his career. He also appeared for Scotland at international level. Celtic supporters flooded fan site Kerrydale Street with tributes to Mr McBride. Chalmers wrote: "It's strange how you might expect a memory of Joe to be one of his many goals, but maybe the trouble is that he scored so many in a relatively short time with Celtic that they all become a bit of a blur. "But my one enduring memory is when a long ball out of defence was immediately controlled by him before it even touched the ground and I could hear someone behind me say 'just look at that' and I agreed that it was a sublime piece of skill. Maybe it's seen more often today, but 45 years ago it was exceptional and in a Scottish sense, before its time. "Farewell to a gifted footballer." Southern Bhoy commented: "Have had the privilege of meeting Joe a couple of times. An absolute gent of the highest order. RIP."